a) Name the tissue found at the tip of a plant root. b) Where else in a plant is this tissue usually found? c) State the characteristics of the cells found in the tissue named in (a). d) When mitosis occurs in these cells, primary growth, which records an increase in length and height, results in the root and shoot. 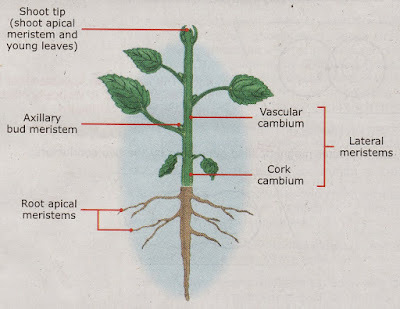 e) For secondary growth in a plant, mitosis occurs in the vascular cambium, a tissue found between the xylem and phloem tissue in dicotyledons. f) Mitosis is important for growth because it increases the number of cells in the organism.